Miami’s Jewelry District is not often talked about. Considering how important a hub for jewelry it is throughout the region, it probably should. Miami-based international jewelry distributors supply jewelry stores in St. Maarten, the U.S. Virgin Islands, Puerto Rico, the Dominican Republic, Aruba, Mexico, North, Central and South America. 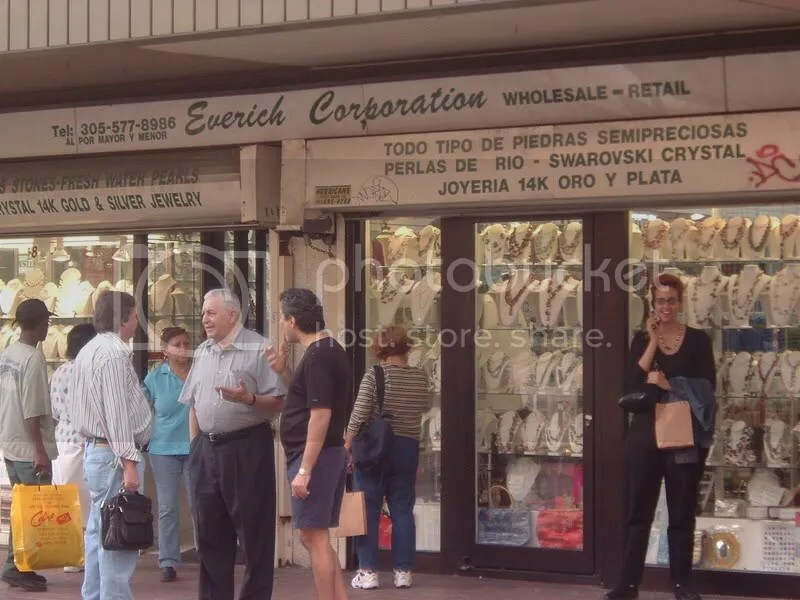 Miami’s Jewelry District is one of the most important in the country due to its influence throughout the Caribbean and Latin America. 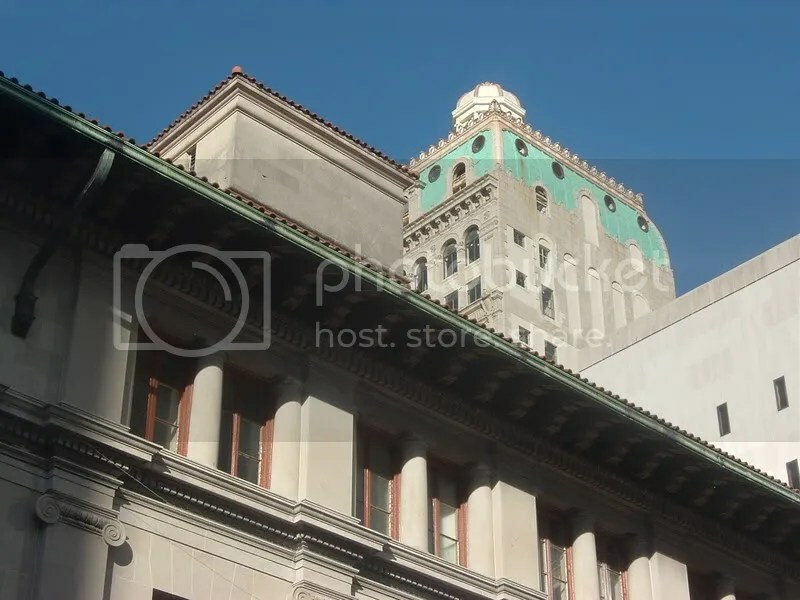 In the neighborhood, you can find loose rubies, emeralds, peridots, aquamarines, and tanzanite at, for example, Ruben’s House of Stones or Royal Gems, in the Seybold Building. In the Jewelry District, Lebanese, Iranians, and Syrians do business with Jews from around the world. English, Spanish, Hebrew, Russian, Arab, Farsi, Urdu, Mandarin and Hindi are spoken by business owners. Vendors from throughout Asia fly-in and meet with existing and prospective clients. Everyday, FedEx, UPS, and DHL trucks clog up the streets due to the heavy volume of jewelry exports and imports from throughout the world. You can find coral strands, South Sea, Tahitian, and Akoya pearls, Cartier watches, diamond tennis bracelets, natural fancy colored canary diamonds, and just about any other rare stone or material used in jewelry. A Hip-Hop producer or professional athlete can buy himself a 32-inch diamond tennis chain with 155 individual ½ carat diamonds set on platinum. Gold is prepared in labs at places like Atomic Gold in the old Foremost Building, now One Flagler. There is more silver in A.G.M. Mfg. than anywhere else in the Florida, at least. Gold chains hang from racks by the hundreds and look like cascades of gold. The entire jewelry industry is represented in the District. There are stone setters, gold mixers, diamond vendors, mold-makers, engravers, polishers, casters, gemologists, watch-makers, pearl stranders and they all do business for the jewelers. There are suppliers for neckpieces , gift boxes, jewelry trays, diamond paper, scales, tweezers, testers, loupes, and just about any piece of equipment or tool related to jewelry. 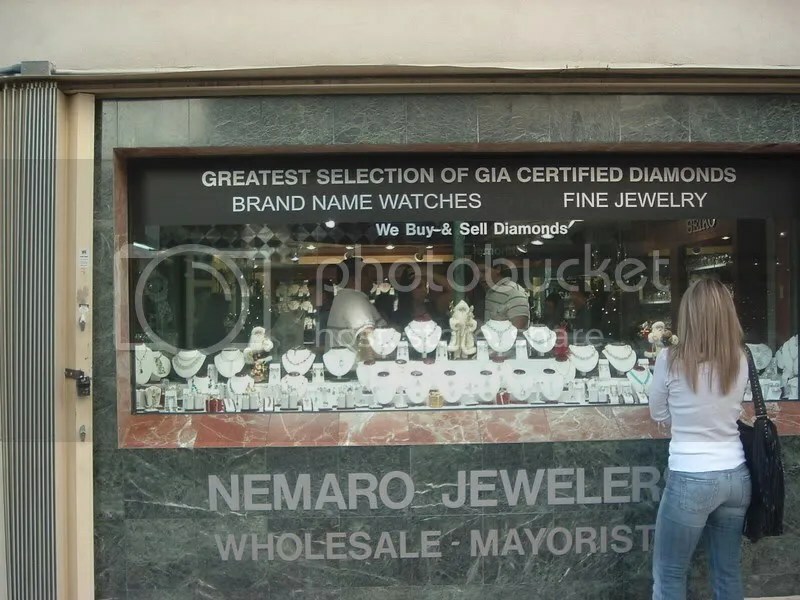 The Miami Jewelry District is the primary supplier for jewelers in Florida and the Caribbean. OroGemma, Accar ltd., Nemaro, Coral and Stone, Michael’s, Ely-M, Metro Gold, Haimov, A.G.M., Diamond Club, Freddy’s Diamonds, Carrion, and Hidalgo are among the most important jewelers in the Southestern U.S. The area, although not large, is filled with activity and is commercially well-established. Not all stores sell to the public. 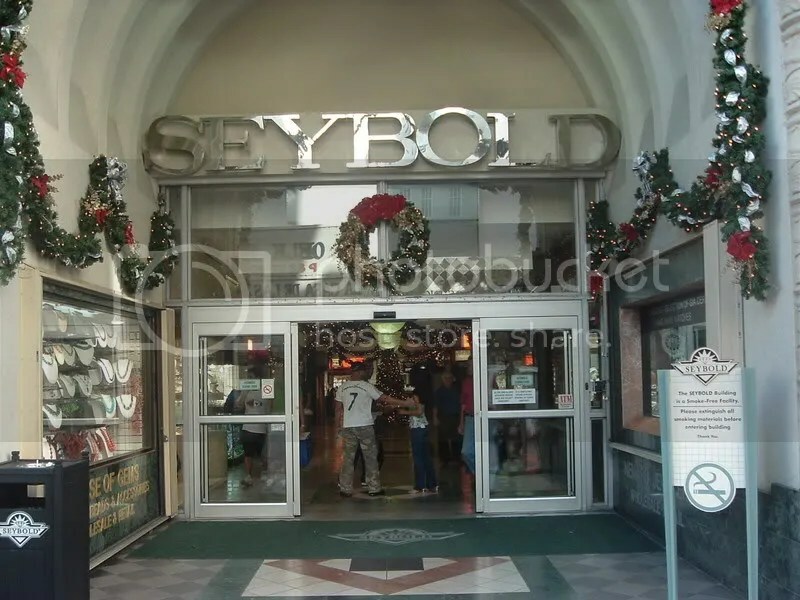 The Seybold Building, built in the 1920’s, is the most popular shopping venue with over 280 jewelry businesses and serves as the center of Miami’s Jewelry District. 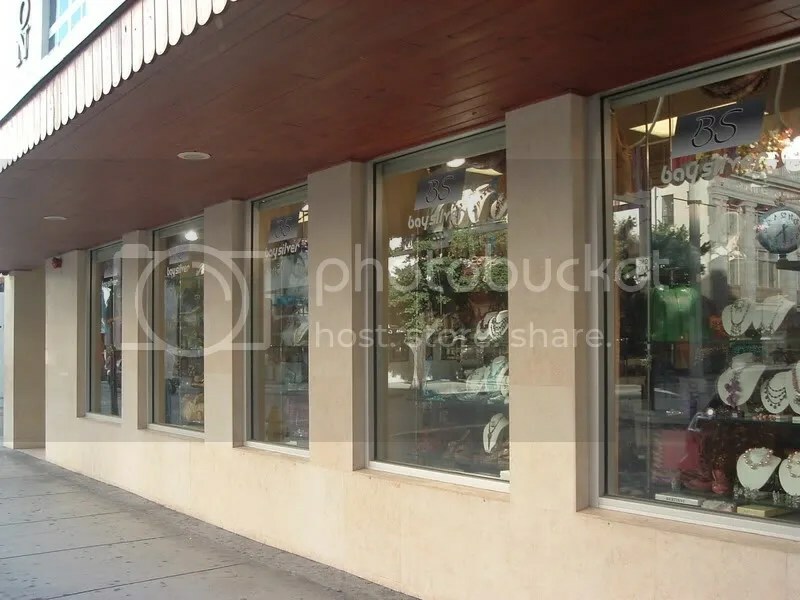 Other establishments to note are Metromall, the International Jewelry Center, the Flagler Jewelry Center, Dupont Building, and there are jewelry stores throughout the area. The Seybold Building has valet parking. There is a garage on N.E. 3rdstreet. The neighborhood is three blocks east of Biscayne blvd. 50 Biscayne, Everglades on the Bay, the Lofts I and II and Met 3 are a short walk away. Capitol Lofts at the Security Building and Flagler First are in the center of the District and are both historic restorations being converted into condominiums. The area will probably become more upscale and retail-oriented as time passes. As it is, the neighborhood is no Fifth Avenue, but given the amount construction, diamonds, jewels and gold present in the area, the District will rapidly evolve and draw more attention than ever before. If the Marlins stadium gets built north of the Stephen P. Clark Center, then it will create a hugely positive effect only a few blocks away from the Jewelry District’s heart. There are plans for City Tower on N.E. 3rdStreet. Lynx is two blocks south, but the project is up for sale. There are some Jewelry shopping facilities that were planned but never opened (The Jewelry Center at 1st and 1st) , there is a new one that was opened but is still mostly vacant (International Jewelry Center), there are several that are a bit old and under-maintained (Metromall and Commonwealth Building) . Flagler One, the old Foremost, is now selling office/condos. The new developments on the north of the Miami River (Mint, Wind, and Ivy) are about two and half blocks south. There are rumors that Jorge Perez’s Related Group has plans for the parking lot west of the Metromall on N.E. 1st street, which if proved to be true, would mark his most interior development in the CBD; a sign of major progress for the neighborhood. 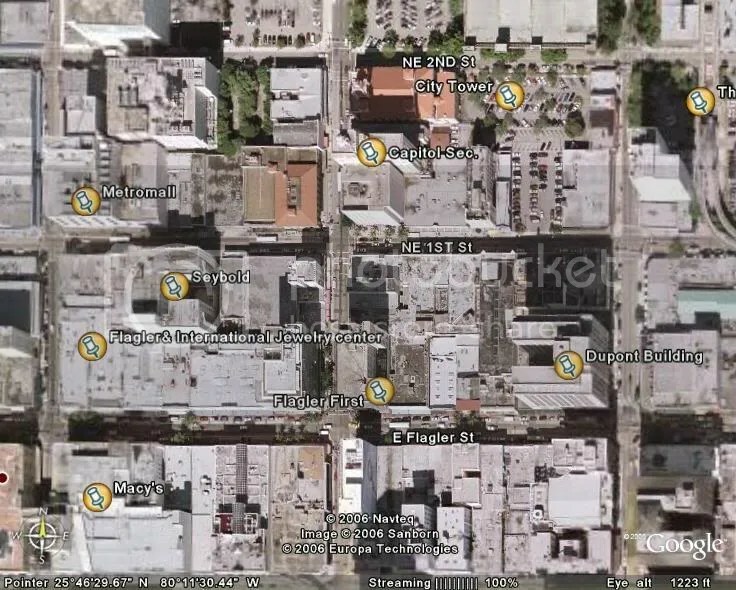 Currently, no Related Group acquisition has been entered into the books, but given his Loft I and II projects and the potential Marlins Stadium in the far west interior, it wouldn’t be surprising if Mr. Perez did spearhead a more westward development effort in the CBD. 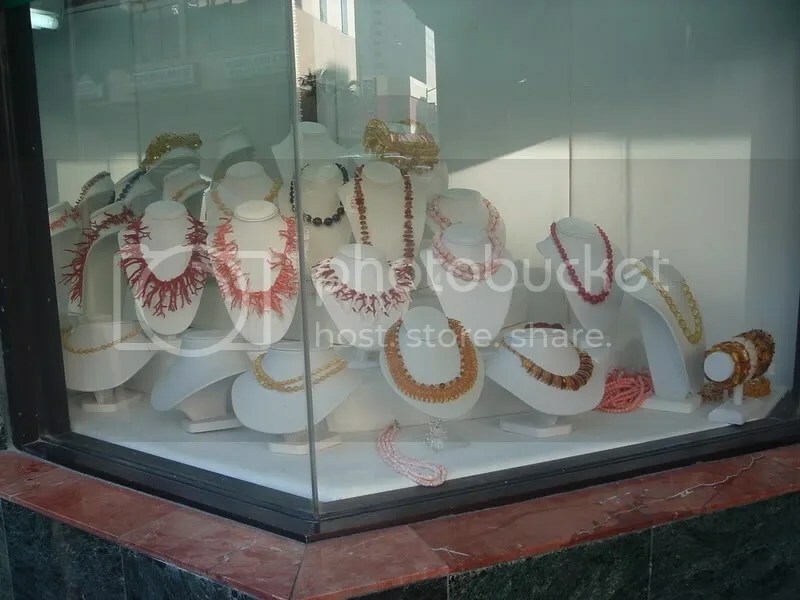 It is important to note that Macy’s has their largest Miami store in the Jewelry District. 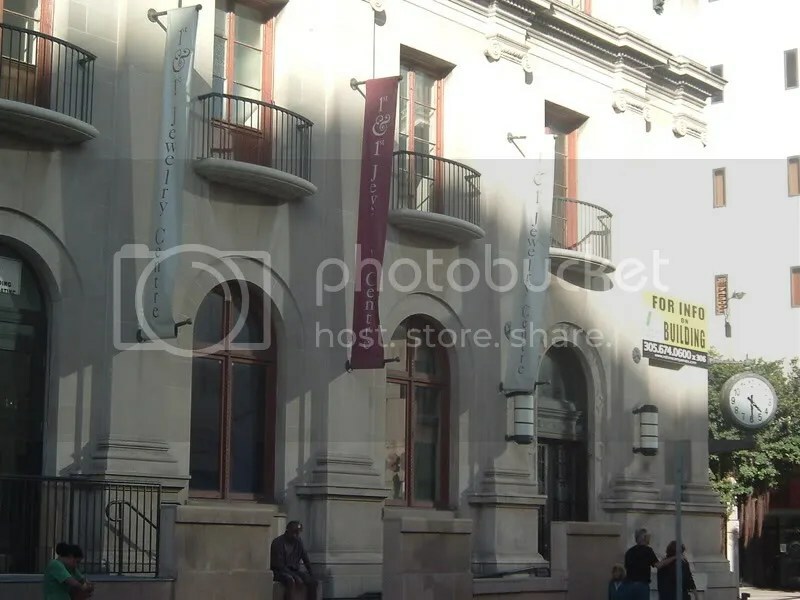 Although it isn’t new, it is huge with multiple floors and can be easily revamped to become its flagship Miami store by riding the neighborhood’s development wave. All the new projects within and around the Jewelry District will provide more shoppers for the District. The sidewalk and street improvements are already benefiting the area as is the new landscaping and palm tree lighting. Currently, the area has no nightlife whatsoever. Maybe that will change after buildings nearby get topped off, new residents occupy the area, and stores and restaurants stay open till later.